We’re taking the groove to a whole new level. TITLE TOWN is tonight. 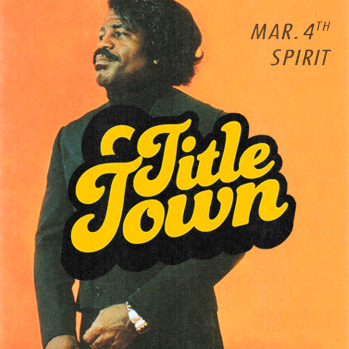 SATURDAY, March 4th Spirit (Upstairs) 242 51st St. Pittsburgh, PA 9pm - 2am; 21+ w/ ID $5 before 10pm / $7 after *** EARLY ARRIVAL IS RECOMMENDED *** Join us on Saturday, March 4th when TITLE TOWN Soul & Funk Party does its thing at Spirit Hall. This month, we're takin' the groove to a new level: UPSTAIRS at Spirit, which means a shorter line at the door and more room to get down. RSVP on Facebook and tell us you're coming.